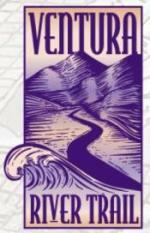 The Ventura River Trail is a 6.3 mile asphalt pedestrian and bike path that follows the old Southern Pacific Railroad right-of-way from Main Street in Ventura to Foster Park inland towards Ojai. The path, originally opened in 1999, connects the Ojai Valley Trail to the Omer Rains Trail along the beachfront for 17 miles of great bicycling. The trail is open dawn to dusk. OK, so now for some commentary. This is not exactly the most exciting bike path in the world. You are paralleling Highway 33 and are kind of off the beaten path in an industrial area, but it is a peaceful path. Also, there are several stops you need to make as you cross streets, so your kids (and you) do need to be aware of that. You won't find an ocean view on this path. But...it is never crowded, quite flat and a great way to get out on the bikes away, for the most part, from automobiles. One of the more interesting, albeit somewhat creepy scenes along the path is this dormant USA Petroleum Refinery that was closed in 1984 after operating less than 10 years. A bit of an eyesore this 96 acre, barbed wire fence enclosed section on the north end of the trail is. In the past there have been homeless encampments in the vicinity, but I've never seen them. What I like to do is park in the free city parking lot near the Omer Rains Trail at the corner of W. Main St and Peking St, then take Main St a block east to N. Olive St, turn left (north) to Rex St. Take a left on Rex to the bike path entrance.